The Mogul Move: a drop step, crosssteps, skimming into a mogul step--and a cross over recovery. In the last article we began analyzing the patterns of defensive footwork. These are Contact Moves used by the top players to neutralize opponents and to transition from defense to offense. We started our analysis of defensive moves by looking at the Power Move. This is the footwork pattern used by top players to hit on the full run. (Click Here.) We saw that top players use the Power Move to go for broke by attempting running forehand winners. Now let's look at a second defensive pattern, what I call the Mogul Move. The Mogul Move is a defensive contact move players use when they are forced wide, but not so wide that they have to hit on the dead run. Instead they move one step beyond the ball and recover. Briefly airborne, the players skim the court keeping and then landing on balance. You also see players use the Mogul Move when they move forward or backward on an angle toward the ball or away from the ball. 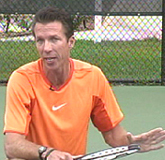 You see all three variations used on the forehand, and both the one-handed and two-handed backhands. I call it the Mogul Move because it resembles how skiers move on a downhill mogul run. In both cases, the athlete becomes briefly airborne, keeping his balance as the feet skim over the ground. The center of gravity stays between the feet, and the hips move sideways in a straight line in the direction of the movement. When players use the Power Move, they end up going far beyond the ball. But with the Mogul Move, this movement is more controlled. 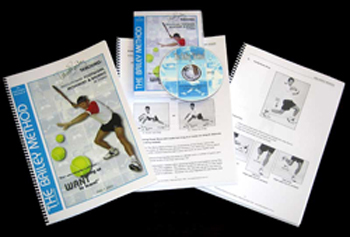 The Mogul Move allows players to control their bodies and go only one step beyond the ball. This contains their momentum, allows them to brake, and then change direction and move back to the center of the court as quickly and efficiently as possible. This is what makes the Mogul Move so effective. It allows players to stay in the point and/or hitting a counterattacking shot. The drop step, the crossover, and the set up in the extreme open stance. The key to making a successful Mogul Move when the player is moving sideways is to work very hard to get out behind the ball. When the player has a substantial distance to travel, he will usually begin with a small drop step and then takes either one or two crossover or running outsteps toward the ball. He then positions the outside foot to hit from an open stance, even though he is still moving through the hit. This can be anywhere from semi-open to an extreme open stance. The outside foot points to the side fence, usually at a right angle. The player then makes contact while the weight is still shifting to the outside. After the hit, the player takes one recovery step--the Mogul Step--beyond the ball. The player should stay low as he goes beyond the ball, keeping positive angles with the legs through the bend in the knees. The Mogul step after the hit, the drop step with the inside foot, and the cross over recover. As he lands with the Mogul step he can then push off with the outside foot to start the recovery. If the player has not traveled far, the recovery steps can be shuffle steps. More commonly, the takes a small drop step with the inside foot, followed by one or two crossover steps and then shuffle steps to the middle. We also see players execute Mogul Moves when moving diagonally either forward or backwards to the ball, and then recovering back toward the center. The basic pattern is the same as with the movement sideways. The player sets up in an open stance, skims through the air, takes a mogul step during the landing, then recovers with a combination of cross steps and/or shuffle steps. The Mogul Move on the forward and backward diagonals. When the player is moving backwards, the cross steps can be in front, but it can also be a cross step behind the body in order to facilitate the most efficient possible recovery. The Mogul Move is a critical pattern in pro tennis because it keeps players from running further past the ball than absolutely necessary. It allows them to stay on balanced and make the most efficient possible recovery. It saves fractions of seconds when they really matter. This is what makes it a critical piece in the pantheon of high level pro movement patterns. Next: The Reverse Spin Contact Move! Stay Tuned.